The good news is that there are lenders out there who want your business. While issuers may not be marketing as aggressively to consumers with poor credit as they did a few years, ago, some are offering programs to these people. In fact, some studies have found that more than a million borrowers with severely damaged credit ratings are now opening credit card accounts every month! The first thing you’ll want to do is to check your credit reports and your credit score. You may have some idea of how “bad” your credit is, but you really won’t know until you check it. 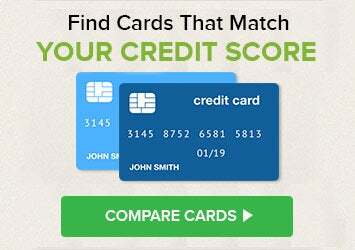 You can get your credit score for free using Credit.com’s free Credit Report Card. You’ll see what factors are affecting your scores and get strategies for getting back on track. It’s also a good idea to check your credit reports with all three major credit reporting agencies to understand what’s being reported and to make sure the information is accurate. What’s a bad credit score? It’s impossible to say exactly since there are many different credit scores available to lenders, and every lender decides for itself what credit scores are acceptable. If you have a credit score below 500, qualifying for a traditional card will be extremely difficult, if not impossible. Most lenders view scores below 500 as a very high credit risk, and are therefore unlikely to approve a credit line. You may wish to consider a secured credit card as an alternative. With a secured credit card a security deposit is required as collateral, typically equal to the credit limit on the card. The security deposit offsets the risk for the lender because it serves as a guarantee in the unlikely event that you default on the card. Like traditional credit cards, secured credit cards come in many shapes and sizes and it’s important to shop around before settling on one. Not all lenders offer secured cards so be sure to do your research and review the features each card offers. In addition, not all secured cards report your payment history to the three credit bureaus. If you’re trying to reestablish your credit, choose a card that reports to all three so that your hard work in managing the account properly is reflected in your credit scores. If your credit score falls in the 550 range, you may still have difficulty securing a traditional credit card. While it’s higher than those in the lower 500s, a 550 is still quite low when it comes to credit scores and is considered a high risk by lenders. As with those in the lower 500s, a secured credit card may be a better option initially. We’ll talk more about secured cards in a moment. If your credit scores fall in the 650s you should have little trouble qualifying for a traditional credit card. It’s important to note that even though scores in the 650 range have an easier time qualifying for traditional credit offers, it still falls within the poor credit range known as subprime and is considered “high risk” by lenders. This means you can likely expect high interest rates and possible fees until you demonstrate a positive payment history and your credit improves. Over time, as your credit improves and you break into the 700s, you’ll be able to take advantage of all the benefits that having great credit affords: the best interest rates and terms lenders have to offer. Once you know where you stand credit wise, you’ll want to shop for a credit card. If your credit score is very low, you may need to get a secured credit card. With a secured card, you place a deposit with the issuer and get a card with a credit line that is usually equal to your deposit. So, for example, you place a security deposit of $250 and your initial credit line is $250. You use secured cards for bad credit like you would any other credit card. You charge items, then pay the bill. Note that this is different from a prepaid card, where you load money onto the card, then spend it, then do that again. Prepaid cards don’t report to credit reporting agencies, but most secured cards do. With a secured card, if you manage the account properly (pay your bills) you will get your deposit back when you close your account. Need help finding a secured card or credit card for bad credit? When you sign up for Credit.com’s free Credit Report Card you will be matched with lenders who are likely to be a good fit. Once you get one of these cards, you’ll want to keep your balances low, and pay your bills on time every single month. Two of the most important factors in your credit scores are your payment history and your “utilization ratio” – which compares your balance to your available credit. Make sure these two factors are as strong as possible and you should, over time, see a significant positive impact on your scores. Tip: Using Credit.com’s Credit Report Card, you can get a free updated credit score every 14 days and track your progress toward building better credit. After you have one of these cards for a year or so, you may want to try to apply for an unsecured card with better perks and fewer fees. However, if you do that, you may want to keep this first card open for a while longer. Unless you need to get your deposit back right away (or if it carries a high annual fee), you can continue to use it from time to time for things you’d buy anyway, and pay the bill in full. By doing that, it will continue to help you rebuild credit. Excellent advice for rebuilding credit using a credit card(unsecured) to improve credit score. Last June 2013 I obtained a n unsecured credit card with a score of 589. By using the card responsibly(pay bill on time and keep credit utilization below 20% of available credit) I have increased my score(s) to 652 on Experian , 653 on Equifax, and 622 on Transunion. My goal is to obtain a score in the 700+ range. It will take time but will be well worth the wait when I obtain “good credit” with all the perks that comes with having a score in the 700+ range. I will only apply for credit when I really need it. I’ve learned my personal finance lesson! I know moving from a secured to an unsecured credit card once you are in a position to qualify is a smart move that can improve your credit score right off the bat (in addition to the future possibility of the satisfied creditor granting you a higher credit limit, improving used/available credit ratio that would ultimately continue to move the needle positive for your Credit Score). A word of caution however: many creditors of unsecured credit cards will give you secured card after you’ve proven yourself, but as a separate card entirely. Some creditors (very few from what I’ve seen) allow you to “graduate” your secured credit card to a unsecured credit card (i.e., use the exact same account you had for secured, return your payment to you, move forward with the unsecured credit card with them under the exact same account [without opening or closing any accounts]). The only company I’ve seen do this is Bank of America (believe it or not). Most creditors require you to open a new / separate account for unsecured card; and if you want your cash payment for your secured credit card back you will have to “close” that account with them and then they will return it. The opening and closing creates noise in your credit report (although I’m not exactly sure how much score it affects), but it is noise that you probably don’t want or need nonetheless. The secured credit card that can be later be graduated to unsecured card is the best route to take if you can. Have you tried a secured credit card? Those are usually available even to consumers with bad credit. You can shop for and apply for a secured credit card here. That is certainly true, though a debit card lacks some of the protections credit cards offer. However, in the case of a data breach, a prepaid card can make some sense because it doesn’t give someone access to your entire checking account. See The Pros & Cons of Prepaid Debit Cards. At 70 I was forced to file bankruptcy. I went from a 785 to 620. With a Credit One card I moved back to 725! Then they wanted to increase my annual fee from $75 to $99 !!!! When I objected they offered to lower my % by 4 points but would not move on the fee. I canceled the card AND AM LIVING WITHOUT ONE FOR THE FIRST TIME IN 50 YEARS!!! If you were concerned about credit scores, we assume you might still prefer to have a higher one, or some of the protections offered by credit cards. While it is certainly possible to live without a card, if you want one, you could consider applying for a no-fee card for someone with a similar credit profile. You can compare credit cards on Credit.com and find one with terms that are better than those offered. The best protection for using credit cards is not getting into a situation where “protection” is needed in the first place. Those of us who use cash for everything from groceries to homes and cars live a lifestyle far different from our unsecured neighbors. The only credit history I have is a short-term mortgage and a short-term auto loan – both paid off within a year or so. I haven’t bothered to check my credit score because I honestly don’t care what it is. Given the risks associated with the credit transaction business, sleeping good regularly is a plus – nobody is tracking me, nobody is profiling me, and nobody is trying to steal from me. Over here on this side of the tracks, if you can’t pay cash for what you want, you can’t afford it. You can get a secured card at any TD bank if you are on the east coast – no fees no % and secured deposit anywhere from $400 and up – look into it PLUS TD bank is open 7 days a week from 8am to 8pm including the inside and the drive up! Counter-intuitively, you will have a higher score if you carry many cards (10 or more- I don’t carry that many, it is just not right). Closing an unneeded card changes your utilization ratio unfavorably, and you lose the good payment history. They are looking for a good mix of loans and credit accounts, but the old, frugal, responsible ways of handling credit don’t seem to mean much. So sad. Does this mean that there is no transfer fees as well as no interest charges until May of 2016? Transfer fees will be listed separately from the interest rate. I always had really good credit (over 750) until my now ex husband co signed my name on a student loan and then didn’t tell me or pay it. I’ve been to the lender, police and even the courts. Nobody gives a damn and I will not pay it. I can’t afford to even if I wanted to. Over 2 years ago, I filed for bankruptcy because I was sued over his medical debts that he wouldn’t pay. He’s a deadbeat. I need a credit card because my car is over 8 years old and needs work and I don’t make enough money to pay up front. Other than the bankruptcy and student loan, my credit would have been excellent. What would I qualify for now? Who would give me a card? Are you still being held liable for the student loan? What kind of loan is it – federal or private? It’s a Sallie Mae private loan. I sent them and the collection agencies cease and desist letters and and advised them to contact my attorney if they have a problem. The prom note does not have my signature as it was an electronic signature. He took the loan out in 2008 and I didn’t discover it until 2011 when I went to refinance my condo. Have you talked with your attorney about a lawsuit for credit damage? My attorney (who graciously only charges me $100 per hour) told me to let them come after me and that I would have to deal with bad credit. At first I was, sort of, ok with that. But now I’m getting frustrated and I have no money to hire an attorney. My ex insisted that I okayed the signature. He is a criminal who has done jail time for writing bad checks. But I hear it’s his word against mine and he had my correct social security number. I’m not sure I agree. You could certainly try filing a complaint with the Consumer Financial Protection Bureau, but if I were in your shoes I would at least consider getting a consult with Joshua Cohen aka The Student Loan Lawyer. He’s very knowledgeable about student loan law and should have some ideas for you. I think sometimes it’s hard for people to understand those who live with less. For example, more than once people have not understood my husband and I’s situation. We’re both disabled, but living on just his SSI, as mine keeps being denied for paperwork reasons. We’re talking $850 per month. We pay our own rent (no subsidies) on a non-restricted apartment, have Internet, cell phones, and my husband smokes. Yes, we receive a little in food stamps, but we don’t cheat the system, we live simple. Yet if we had to buy a house or car, we’d never be approved credit, even though we’re responsible. Yet when policy makers start talking about cutting food stamps or social security, they’re talking death to people like us. We don’t make enough to “tighten our belts,” any less and we’re homeless and starving. Period. It’s hard for people with more to understand how we live, because they feel like they’re struggling themselves. But it’s real. This is not the American dream my father went to war to protect, this is not the promised land my ancestors died and starved to get to. The system if flawed, not the people. I have had 7 spinal surgeries. I didn’t stop working until prior to my 6th and that because my physical situation was beyond my control. I woke up paralyzed from my last spinal surgery. I have worked myself hard to walk again. While I appreciate that you and your husband are both disabled, I also know there are absolutely things you can still be doing to make money that will not interfere with whatever is wrong with you. If you can use a computer, a cell phone a car, then you can make money, even part time, delivering pizza, newspapers, working from home as an assistant. Cook meals for people who don’t have time. Tutor kids, Some of these suggestions aren’t pretty, neither is being broke. When you think you have it bad – just remember someone has it worse. Do research online. There are a lot of ways to make money. The American Dream was made by overcoming adversity – it always will be. That sounds very positive, however, There are people that can do no work! They don’t say strokes can take away everything you have learned in the Blink of an eye. I have a sibling that I have always been proud of and looked at as a prime example of the american dream. The sibling went from over $40,000 a month years ago, and now my sibling does not know the address or phone number or Mothers name. People don’t plan on bad health interrupting their lives. And I gave up a promising career and almost died being a caregiver to my spouse without caring for me. I had a stroke and was hours away from a coma. If her husband is totally disabled, which he has to be to be eligible for SSI-She is a caregiver and a disabled person. She can’t hire a cook and she can’t hire a maid. Determination can get people in good places depending on the situation. I used to listen to Suze Orman say ” People first, Then money, Then things”, and I wondered why did she say that? Life taught me you lose all your money and all your things and people are alright (healthy) you can get money back and replace your things and life is fine, but being totally disabled with certain conditions are a totally different ballgame. My prayers go out to the family with both spouses disabled, and others that need it. Just so you all know, what the credit card companies bank on is the fact that most americans have little to no savings. So even if you are “responsible” they KNOW that sometime you will have a major unexpected expense come up and you’ll have to charge it and then they’ll get you on the interest rate…. I was about to apply for an unsecured card because A) a bankruptcy B) credit.com sees no activity (Experian guesstimate: 649). My question: My Experian report says one item will be dropping in Feb., two in March. Other than rebuilding credit, I have no current need for a card. Should I hold tight with regard to the cc until these three items drop? I am blessed with a score of 829! God is truly watching over me. I don’t have any problem paying my bills but I am in default on a dozen or so student loans so No matter what I do I can’t get my credit score out of the 500’s. I don’t need or want a credit card, but when I travel for work I need to rent a car and secure a hotel. Aren’t there any credit cards with insulting low limits ($20) just for these fools that require a credit card for cash customer. You could consider getting a secured credit card; its limit is typically the amount you put down to secure the card. Is Credit One unsecured card a good card to go with? If I’ve already requested and been approved, can I back out of it without any fees? According to the website for one of the cards (there are several): “As long as you cancel your Account and have not used your card for any Purchases or Cash Advances and you have not made a payment” you can cancel without paying any fees. You will have to make your own judgment as far as the best one to go with. Credit One has fees and relatively high interest rates, but it is available to people who have poor credit. If your credit is good enough to get a card without fees and with lower interest rates, that might be better. (Or you could use a card designed for people with low scores to improve yours and then get rid of it when you no longer need it for that purpose.) Here’s how to monitor your credit score for free.